When I was in grade school they had this really creepy reading program they did every year called P.A.R.P (Parents As Reading Partners). There'd be all sorts of rewards for reading books at home with your parents, and assemblies where the mascot, a pantless purple furry costumed monster type thing also named Parp, would walk around and creep the little children out. There was also a program called DEAR that we'd do at the same time, which was Drop Everything And Read. It involved different rewards and was completely seperate from PARP... I don't understand why they made us do both of them, and my parents and I never did read those books together, I read them myself and lie to my teacher that my parents read with me. 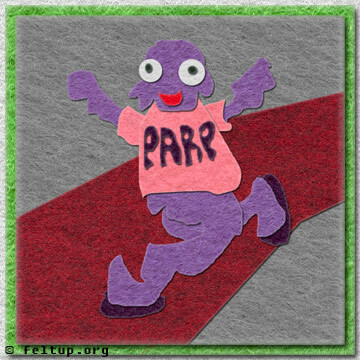 The only reason I even bring this up was because I want to Drop Everything And Play A Fun Game, but I had to make this thingy for today and stuff.. so I made the crappy PARP guy.